Since 2006, law enforcement officers, fire fighters and EMTs in Salina have come together every October to raise money for local families in need.. Among other things, a charity flag football game has been played. In 2014, the Salina Guns & Hoses organization was formed. According to the organization, over the last 4 years, they have been committed to raising money for local families who have children battling health conditions from cancer, to organ failure, to rare birth defects. To date they have raised over $90,000 for 10 families. The organization donates 100% of the funds raised. On Sunday October 14, 2018, the community will rally around Hayden. Hayden is 10 years old. He was diagnosed with chronic kidney disease at the age of nine months. 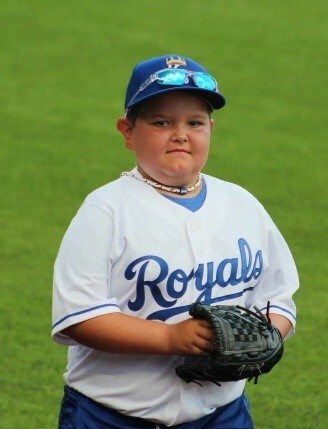 When he was three years old, he received a living donor kidney transplant from Jenny, a caring Salina resident. Since then, he has been hospitalized multiple times due to donor specific antibody (DSA) kidney rejection, cellular kidney rejection and multiple viruses. Due to his compromised immune system, Hayden remains very susceptible to viruses. In early 2018, Hayden fought influenza A, influenza B, BK virus, HHV6 virus, high blood pressure and another bout of cellular kidney rejection. This required 6 weeks of hospitalization at Children’s Mercy Hospital in Kansas City. The family continues to make trips to Kansas City several times each month for treatment and blood tests. The family fears that Hayden may again be in cellular kidney rejection, meaning he may need a second kidney transplant. The Salina Guns & Hoses flag football game is Sunday October 14, 2018 at 1:00pm at Kansas Wesleyan University’s Graves Family Sports Complex. Gates open at noon. There will be food, entertainment for the kids, raffles, and an auction. With the community’s support, they hope to eclipse the $100,000 mark this year. Also, mark your calendars for Saturday June 1, 2019 for the 4th Annual Salina Guns & Hoses 10-FORE Golf Tournament. Follow Salina Guns & Hoses on Facebook to keep up-to-date on everything they are doing, and have planned. Hayden is 10 years old. He was diagnosed with chronic kidney disease at the age of nine months.